Get a better understanding on the difference between Kush and Haze cannabis plants. Learn about the influence of plant genetics on the marijuana experience, and some of the best Kush and Haze strains available. In the long, storied history of cannabis strains, several names rise to the fore, but a couple big names keep popping up in smoke sessions across the globe. Many of the most popular strains smoked today find either Kush or Haze at the end of their names, meaning they count on one strain or the other as a parent. The pleasure of smoking a particular strain stretches well beyond its name though, and each family of strains offers their own rewarding experience. Just because two great strain names rise to the top doesn’t mean they are the same kind of great. While both are known for their potency and exquisite flavor, the two types vary greatly in their scent, appearance and how it feels to be under its influence. One main way to differentiate between the two is that Haze takes on more sativa-dominant traits, whereas Kush follows a more Indica-dominant subgroup. The words “Haze” and “Kush” can be misused in an attempt to make lesser-quality flower more appealing, so know your source, and appreciate each bud on its own merits. Both strains bring with them the history of a rich tradition of marijuana cultivation, and they carry the wisdom of many green thumbs forward in hybrid after hybrid that boast their name. “Haze” rose to prominence in Northern California around the same time. Haze’s long flowering time slowed its initial take off, and the strain was almost extinct by the 1980s. Then some Haze seeds made their way to the Netherlands, into the hands of cannabis seedbanker Neville Schoenmakers, who crossbred them into the sativa superstar known and loved today. “Kush” takes its name from the Hindu Kush mountain range, which stretches through Afghanistan, Pakistan, and India, where the strain emerged as a regional landrace plant. In the 1970s though, it would be introduced to the United States, where it quickly gained popularity with growers and consumers alike. When looking at these strains side by side, you can see the difference in the plant as it grows and in their smokable buds. Indica-dominant Kush has broader leaves and is stout by nature. The plant’s compact size helps it grow easily indoors and outdoors. Sativa-dominant Haze on the other hand, grows tall and thin. Some can grow up to 25’ (approximately 8m), which explains their popularity in outdoor grows. Haze leaves reflect their sativa nature, skinny and long. The flower buds of Haze and Kush plants also differ sharply. Haze buds are lighter green with lots of hairy bright orange pistils covering the outside of the flower. Kush varieties are brightly colored, with deep green and rich purples. Taking in a big whiff of these strains will also let the user know which plant they are about to use. Indica-dominant strains tend to have a sweet and sour odor while sativa-dominant strains seem to have more fresh types of odors to their buds. Haze and Kush strains generally follow these broad characteristics, but their own aromas help differentiate between the two. Haze has a uniquely spicy, citrus smell that is earthy-sweet. It definitely stands out in a crowd. Kush carries its own distinctive sweet, pungent earthiness, but it hits the nose hard with rich notes that can vary with pine, spice, pepper, and even incense. Reflecting through each inhale and exhale provides the smoker a unique experience when it comes to the taste of each strain. Both of these strains boast distinctive flavors. Haze strains taste “brighter”; they are said to have earthy-sweet citrus profiles with an almost a sweet-and-sour flavor. Kush strains offer smooth and complex flavors, filled with notes of flowers, grape, citrus, diesel, and earth. When using these strains, their experiences differ widely: Indica strains lean to strong body highs and are helpful for people looking to relieve anxiety, body pain and insomnia. Sativa plants provide an experience described as uplifting and energetic. Their cerebral highs drop the user in creative, active moods, but every experience is different. Both Haze and Kush are known for their highs feeling euphoric and “happy” in nature, but Haze highs feel more energetic while Kush tends to feel sleepier. Hazes are heavy-hitting among sativas. Their potent cerebral and social head highs are accompanied by a body brightness thanks to its medium-level CBD content. 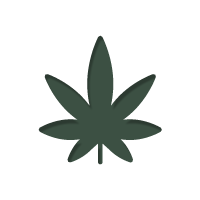 Kushes are typically heavier indica varieties, providing significant body sedation and pain relief. Amnesia Haze is a cross between the original American Haze and a Dutch variety, and it provides a stellar head high. Because of its strong sativa dominant lineage, Amnesia Haze pushes the boundaries of psychedelic toking with its THC reaches around 20%. It's a medium sized plant growing to about 120cm and yielding 600g/m². Super Silver Haze was created when Dutch growers crossed Skunk Haze and NL Haze. The result is a plant with high THC levels that bring a head buzz to every session. She reaches a height of 70-80cm and potentially 200cm with enough light. Super Silver Haze yields growers an average of 500g/m². This plant's sweet flavour has sativa lovers always coming back for more. Liberty Haze crosses the power strains Chemdawg 91 and G13. It results in a plant that offers a powerful, uplifting, social high. This plant stays on the smaller size (100cm), so she can save her energy to produce fat, dense buds that make a grower's mouth water. Liberty Haze takes sativa smokers to a new level by giving them the energy to tackle anything that may come with a smile. OG Kush mixes Chemdawg, Lemon Thai and Pakistani Kush for a sweet and sour experience for both body and mind. The high THC levels help with stress, anxiety and insomnia. She is a perfect strain for both body and mind with a sweet flavour with every exhale. OG Kush grows only to 100cm in height and yields approximately 500-600g/m². Purple Afghan Kush is an indica dominant plant derived from Black Domina and Purple Afghani. She is pure relaxation with every puff. Her beautiful purple hues are only matched by her 70% indica dominance. Purple Afghan Kush grows to about 200cm and yields 500g/m². This potent plant takes away stress with every toke. Power Kush crosses both Afghani and Skunk, and teeters back and forth between head and body high. Either way, being peaceful and taking away stress is why this plant is so well known. Growers can expect an average of 550g/m²in yields from this beauty. Smoking this bud will bring on a body buzz for which all indica lover are seeking.